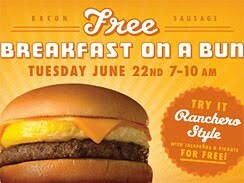 Whataburger will give away free "Breakfast on a Bun" sandwiches for dine-in or carry-out on Tuesday, June 22, from 7-10 a.m. as part of a "Whataburger Serves" customer appreciation event at all of its 700+ locations. The Breakfast on a Bun comes with a fresh egg, choice of bacon or pork sausage, and a slice of real American cheese served on a toasted bun. During the event, customers can order it "Ranchero Style" with jalapenos and salsa at no extra charge. The Breakfast on a Bun offer is one sandwich per customer, and the customer must be present to receive a free sandwich.